Mike Anderson's Ancient History Blog: Who were the Etruscans? The story of the Etruscans is an interesting one -- interesting and obscure. Their history is remarkable when measured by their accomplishments as merchants, craftsmen, traders, and influencers of Rome, but we only know pieces of their story. The emperor Claudius tried to help us by chronicling their history in twenty volumes, but his work did not survive. Meanwhile, the Etruscan language has defied our understanding and, other than some decoding of artifacts, we can’t read it. Still, three of the Roman kings were Etruscans who helped launch the Republic. Ultimately, the Etruscan culture would die and fulfill an ironic prophesy. The area of Italy we know today as Tuscany was originally settled by the Villanovans, an iron age culture that had migrated from Northern Europe. The Tuscan branch is referred to as the Northern Villanovans but there was also a southern faction extending beyond Rome into Campania. The term Villanovan comes from their discovery in an ancient cemetery near Villanova Italy, eight miles from Bologna. The Villanovans were not a uniform culture or society, but more of a group of tribes with common interests. They were expert metal smiths and potters who cremated their dead and buried them in cone-shaped graves. 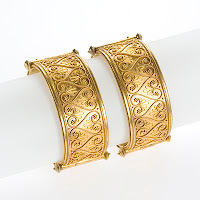 The earliest Villanovan evidence dates from the beginning of the Iron Age and continues to 500 B.C. Through artifacts, we can document their social evolution showing the tribes transitioning into a socio-economic hierarchy. What we see in the archaeology is the appearance of Etruscan settlements where Villanovan settlements once stood. Why? Perhaps they co-existed and eventually merged into one culture. The Romans called these people Tusci or Etrusci, creating the link to the region later called Tuscany. The map shown above shows the territory of Etruria with its major cities. The Etruscans were farmers first – taming the wild land of Tuscany to grow emmer (a type of wheat) which was husked and unsuitable for bread making until they were able to create new cultivars. Olive oil was unknown in Etruria as late as 581 B.C, but must have been imported from Greece. Home grown wine grapes, like olive trees came later. The Etruscans were skilled at irrigation, and the excavated tunnels suggest an organized approach and central authority behind the engineering. Although Italy is not blessed with significant metal resources, what is there was concentrated in Etruria and, as metalworkers, the Etruscans excelled. They mined and worked precious metals, tin to make bronze, and iron. The photograph below shows an example of Etruscan craftsmanship. Jewelry and metalwork became items of trade for the Etruscans and they developed a substantial merchant fleet. Allies of the Carthaginians, they traded throughout the Mediterranean including Southern France and Spain. Tarchna (Tarquinnii) was perhaps the richest and most famous of the Etruscan cities. At its peak from 650-500 B.C, Tarchna was the center of bronze production in Etruria. Everywhere in the archaeology of the city we see a culture with evolving sophistication. The dead were cremated and buried in painted amphoras, temples were built, and life was represented in art – banquets, dancing, athletics, chariot racing, and hunting. We also see an early political system made up of clans, anticipating the Republic. Ancient Rome was also Villanovan, but there was no Etruscan Villanovan marriage there. One suspects the independent nature of the native Latins was responsible for blocking Etruscan assimilation. Ultimately the Etruscans would occupy Rome, but it was not by a gradual mixing of cultures. Prior to their arrival, the Latins were mostly a pastoral people. The Etruscans influenced them to become more commercial (and maybe the Greeks in Campania had an influence also). The end result was the light went on for the Latins and their culture began to advance. In Rome, the Etruscan influence was everywhere – from the new temples that were constructed to the evolving political system. 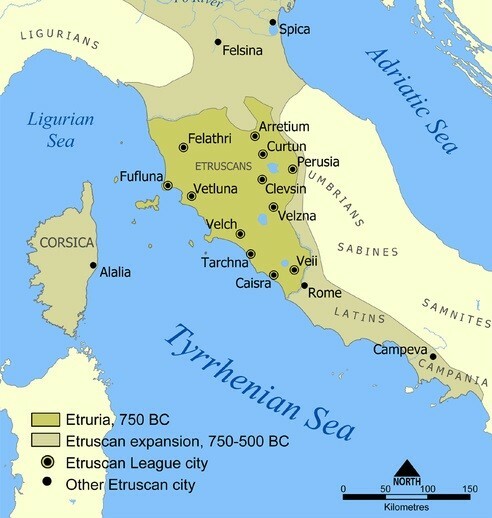 Historically, Etruria was made up of an alliance of free independent city-states. Although they had common interests, the cities openly competed with each other and went to war when necessary. The ruler was an all-powerful king who acted as both a political and religious leader. Unfortunately, we know little of the Etruscan political system outside the period when they gained influence over Rome and the history was recorded. The last three kings of Rome were Etruscan (616-510 B.C. ), so we can see Etruscan influence over the formation of the Roman government, which was different from the historical Etruscan model. During that period, across the Mediterranean and into Asia, aristocratic factions had begun to peck away at the authority of the kings. The first Etruscan king of Rome, L. Tarquinius Priscus, created one hundred new Senators to win popular support, so even at this early point of Roman history the king was not powerful enough to function as an autocrat. Priscus also build the first wall around Rome and added sewers to drain the Forum. His successor, Servius Tullius, divided Rome into tribes and instituted the census for the first time. He created the Centuriate assembly which classified the army by wealth and gave the wealthy the most powerful voting blocks. In 509 B.C, the last Roman king, L. Tarquinius Superbus, was expelled and Rome became a Republic. The ascendancy of the Republic hastened the decline of the Etruscans. The nearest Etruscan city, Veii, fell to the Romans in 396 B.C. At the same time, the Northern Etruscan cities were attacked and ravaged by a Gallic invasion. By 273 B.C. Etruria was firmly under Roman control as part of an Italian confederation. As time went on. the Etruscans provided troops to the Republican army and, during the Second Punic War, they were able to avoid Hannibal all together. Later, they took sides in the civil wars supporting Caesar and suffered devastation as a result. The Etruscan culture ultimately faded into history. In the beginning of the article I mentioned an ironic prophesy, which was the prediction of the end of their civilization. The Etruscans were ultra-religious and I think it was Cicero who said they were the most religious people in the world. They believed their race (or any race) is given a fixed span of time by the gods – in their case 10 saecula of 70 years. The Etruscan civilization was established in about 750 B.C and after the 700 years had passed, they were no more. "In 509 B.C, the last Roman king, L. Tarquinius Superbus, was expelled and Rome became a Republic." Rome was already a republic. I don't get this. How and why did Aristotle define Sparta a "politiea"? Don't overreact. When I said Rome became a Republic I was using the generic term as in "The Roman Republic". 1. The king was replaced with the consular magistrate designed to prevent the accumulation of power. 2. The consuls were selected from the patrician class and lacked hereditary authority. 3. The political leader gave up the role as religious leader when the Pontifex Maximus was created. This represented a balancing of power not seen under the kings. Overall, I believe that your piece does a very good job of summarizing the Etruscan civilization. One point of clarification regarding the Etruscans' origins though. While Herodotus' Anatolian theory is perhaps the most well-known of the different theories on the Etruscan origins, many do not believe that the Etruscans originated in Lydia. Dionysius of Halicarnassus, writing in the first century B.C., was the first to raise the question. He believed that the Etruscans were an indigenous group within Italy. Modern scholars are still in disagreement regarding where the Etruscans came from. Several genetic studies on ancient Etruscan remains, as well as modern Tuscans, have been performed, but while some of these studies say Herodotus got it right, others disagree. Much thanks, I very much enjoyed reading over your overview. Thanks for your comment. I'm aware of the views of Dionysius on the subject of the Etruscans. I look at all views on a topic and then select the one I consider to have the strongest case in order to avoid exposing my readers to a stuffy academic debate. Scholars have repeatedly looked at the Etruscans as indigenous (or more correctly autochthonous), Northern European, or Asian, but there are some aspects of their language and alphabet that are more Asian than European. Still, we don't know for sure. If you're interested in the detail, I highly recommend HH Scullard's book "The Etruscan Cities and Rome". The Etruscans used the Greek alphabet as the basis for their writing. On their language we know extremely little, only the meaning of a few hundred words.